There have been a handful of major innovations that have truly lead to fundamental changes in the way surgery has been performed. The laparoscopic and robotic surgery are two more recent developments that have profoundly influenced the way many operations are done. In order to understand their importance, they must be contrasted with traditional “open” surgery. “Open” abdominal surgery is accomplished by making an incision through the abdominal wall that is large enough to provide the surgeon with a direct three dimensional view of the operative site, the ability to feel the structures being operated on, and unrestricted access to the patient’s anatomy so the surgeon can use his/her hands to accurately position and use a wide array of surgical instruments inside the patient to perform a wide variety of complex and challenging surgeries. Prior to 1989, the open surgery was essentially the only surgical approach available for performing abdominal hernia operations. However, large incision in the abdominal wall causes more trauma which translates to more post-operative pain, longer hospital stay, slower recovery and return to regular activity and more post-operative complications including wound complications and adhesion formation. In laparoscopic approach, the rigid scope and instruments are entered the abdominal cavity through multiple small incisions to visualize and perform the robotic surgery procedures. This technique eliminates the necessity for large incision and therefore decreases the abdominal wall trauma which translates to less post-operative pain, less hospital stay, faster recovery and return to work and less wound complications and adhesion formation. There are limitations for laparoscopic robotic surgery. The video image is 2-dimentional, the instrument are rigid and un-wristed and the surgeon’s hands are now located outside of the patient where there is no longer the natural touch and feel of the tissue associated with open surgery. Over the last two decades the advance laparoscopic surgeons have been able to overcome these limitations and perform even very complex surgical procedures with laparoscopic technique. However, an approach was needed to restore to the surgeon the capabilities of open surgery while maintaining the patient benefits of laparoscopic surgery. This was accomplished in 1998 by Intuitive Surgical, Inc. with the development of a “robot” known as the da Vinci® Surgical System. The da Vinci Surgical System® provides the surgeon with unparalleled dexterity, precision, and control and restores nearly unrestricted freedom of movement of these articulated instruments inside the patient. Also Intuitive Surgical brings intelligent robotic technologies for innovated robotic surgical procedures. They make surgery more effective, less invasive and easier for surgeons, patients and their families with a fast recuperation and better outcome. The creation of this robotic surgery system thus removed most if not all of the physical limitations placed on the surgeon by conventional laparoscopic surgery. This has resulted in two very significant advances in surgical practice. In the hands of surgeons skilled in its use, it not only enables laparoscopic techniques to be used in more complex abdominal procedures but in some operations it allows us to actually improve upon traditional open surgical techniques as well. When considering surgical options, many patients have concerns about safety. Some patients may question whether da Vinci Surgery is as safe as open surgery or traditional laparoscopic surgery. Da Vinci offers multiple redundant safety features. First and foremost, the da Vinci System cannot be programmed, nor can it make decisions on its own. Instead, the da Vinci System requires that every surgical maneuver be performed with direct input from the surgeon. Tremor reduction minimizes unintended movements, which means that da Vinci instruments can move in a more precise manner than a human hand. And because the da Vinci Patient Cart does the work of holding and re positioning the instruments and camera – and because your surgeon operates while seated – surgeons can experience much less fatigue in performing surgery with the da Vinci System. Our Orange County Surgical Center is fully equipped with the latest robotic surgery technology that da Vinci and Intuitive Surgical provides to our surgeons. Finally, during the course of an operation, the da Vinci System will perform millions of safety self-checks. The System is designed to be fail-safe, which means that in the event of power interruption or a safety-check failure, the System is designed to shut down safely, allowing the surgeon to remain in control of the procedure. There have been some major benefits experienced by surgeons using the da Vinci Surgical System over traditional laparoscopic approaches. These benefits are greater surgical precision, increased range of motion, improved dexterity, enhanced visualization and improved access. 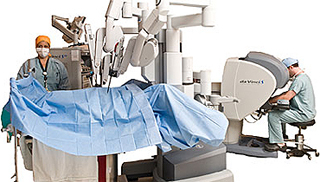 The da Vinci System is a robotic surgical platform designed to enable complex procedures of all types to be performed .” To date, approximately 1.5 million procedures including general, urologic, gynecologic, thoracoscopic, and thoracoscopically-assisted cardiotomy procedures have been performed using the da Vinci Surgical System. Patients should talk to their doctors to decide if a robotic surgery by da Vinci Surgical systems is right for them. Other surgical approaches are available. Only a doctor can determine whether da Vinci Surgery is appropriate for a particular patient’s situation. Only surgeons who have developed adequate robotic skills to perform the tasks associated with each procedure and who have received specific training in the use of the da Vinci Surgical System should use the system. At NEWPORT LAPAROSCOPY, Dr. Iraniha Robotic Surgery Expert performs single incision robotic cholecystectomy, robotic hernia repair and robotic colorectal surgery. 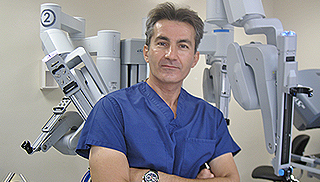 He is one of the pioneer of the robotic inguinal hernia repair in this Orange County, California. All robotic surgery presents risk, including da Vinci Surgery. Results, including cosmetic results, may vary. Serious complications may occur in any surgery, up to and including death. Examples of serious and life-threatening complications, which may require hospitalization, include injury to tissues or organs; bleeding; infection, and internal scarring that can cause long-lasting dysfunction or pain. Temporary pain or nerve injury has been linked to the inverted position often used during abdominal and pelvic surgery. Patients should understand that risks of surgery include potential for human error and potential for equipment failure. Risk specific to minimally invasive surgery may include: a longer operative time; the need to convert the procedure to an open approach; or the need for additional or larger incision sites. Converting the procedure to open could mean a longer operative time, long time under anesthesia, and could lead to increased complications. Research suggests that there may be an increased risk of incision-site hernia with single-incision surgery. For more information or to make a consultation with Dr Iraniha please contact us or call at (949) 646-8444. Thank you.